Click the banner for a complete list of readalong posts. The chapter opens with the first Christabel LaMotte poem we’ve seen so far, a chilling reimagining of the Rapunzel story, in which an unknown “he” watches an evil “humped one” climb Rapunzel’s hair in his place. Roland is off to meet Dr. Maud Bailey at the University of Lincoln, and he catches up on some LaMotte background while he’s on the train. He notes the change in scholarly attitude toward her: a biography from the 1940s dismisses her Melusina outright, calling it “now deservedly forgotten,” but applauds her “domestic mysticism,” her “delicate lyrics,” and her “troubled but steadfast Christian faith” (p. 37). Whereas, Roland notes, “thirty years later the feminists saw [her] as distraught and enraged,” focusing on a repressed indignation at feminine domesticity, her “occluded lesbianism,” and subversive female roles in Melusina. Rapunzel. Anonymous artist, circa 1909. Off the train, Roland meets and is immediately intimidated by Maud, who is much taller than him, is dressed impeccably with her hair wrapped in an elaborate turban, and who comes off as icily professional and somewhat condescending. She takes him on a tour of the university, which is the opposite of the Ash factory: rather than being buried in the hot, windowless bowels of the museum, the university is all white towers, brightly coloured tiles, libraries made of glass. Maud, a self-sufficient modern-day maiden, lives at the top of Tennyson Tower, and her office is glass-walled on one side, with highly organized books and not a speck of dust. Everything is opposite to Roland’s experience. She sets him up in the library with the diary of Blanche Glover, the woman with whom LaMotte lived, her close companion and possibly her lover. In Blanche’s diary, Roland finds mention of the brunch were LaMotte and Ash met. Blanche comes off rather snappishly, wishing only to be home again. She refers to LaMotte as “the Princess” in an affectionate way. In subsequent entries, he traces several mentions of letters Christabel has written or received but kept hidden from Blanche, who grows increasingly paranoid and bitter regarding them, all but ranting about a “Prowler” skulking about their home, and finally, triumphantly writing “The Wolf is Gone from the Door” (p. 47). When he reconnects with Maud later in the day in the Women’s Studies block (“Am I allowed in?” he half jokes), she is intrigued. Though he still finds her demeanour icy and unnerving, he perhaps recognizes something kindred and confides in her about his theft of the letters. It’s getting late and and Maud suggests he stay the night and they resume work tomorrow. He points out that as an all-but-unemployed researcher he can’t afford a hotel, so she offers to put him up for the night. Maud’s home is again the opposite of Roland’s. Where his is a dank, disorganized basement, hers is an airy, pristine set of rooms. As she prepares dinner, he reads from her first edition of LaMotte’s Tales for Innocents, choosing a story about a shoemaker’s daughter who gives birth to a monstrous half-human half-hedgehog. The woodcuts in the first edition were done by Blanche, who was an artist. Maud tells Roland that she herself is distantly related to Christabel, whose sister married a Bailey. Her family, the Norfolk Baileys, is estranged from Christabel’s part of the family, the Lincolnshire Baileys, anyway. Still, one gets the idea that Maud is from a very comfortable background, financially. Maud shares the poem that first entranced her about Christabel, and Roland does the same with Ash. They both agree that they do what they do because the words of LaMotte and Ash respectively “were what stayed alive, when I’d been taught and examined everything else. . .what could survive our education” (p. 55). Roland shows Maud his original Ash draft letters, and she sees them as “alive” intuitively, just as he did. Finally, retiring to bed, Maud contemplates her beautiful long blonde hair that she keeps hidden away, and her affair with Fergus Wolfe, and Roland reads “The Glass Coffin” from Tales for Innocents. We are presented this story, a retelling of a Grimm tale, in its entirety. Chapter Five opens with an Ash quote from “The Incarcerated Sorceress,” which may share themes with some of Christabel’s works. Roland and Maud decide to go to Seal Court where Christabel lived, which is also where Maud has distant family. They find Christabel’s grave, which looks to have been recently taken care of, and then Roland sees an old woman in a wheelchair stuck in the road. He gallantly offers assistance, removing the large piece of flint that’s been bedevilling her, and getting muddy in the process. Then learns she is Lady Bailey of Seal Court. Her husband, Sir George Bailey, and their dog Much arrive and Lady Bailey invites Roland and Maud back to Seal Court so that Roland can clean himself up. Maud tells them who she is and they catch up on distant family gossip as they observe Seal Court: a vast estate meant to be run with a full staff and a lot of money, Lord and Lady Bailey live there alone and only inhabit a small portion of the main floor. Roland and Maud share their interest in Christabel, whom George scoffs at. Lady Bailey chides him and insists he let them see Christabel’s old rooms, upstairs in a part of the house that’s never been wired for electricity and hasn’t been visited in ages. George tells them about Leonora Stern’s visit—a garrulous American and unbeknownst to George, Maud’s academic rival in LaMotte studies—and how he ran her off the property with a shotgun. Maud knows that Leonora is the one who recently tended Christabel’s grave. 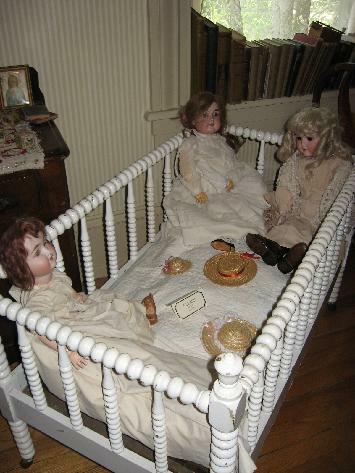 Inside Christabel’s untouched and dusty quarters, Maud is jarred when she sees a set of three dolls, which Christabel wrote poems about. Instantly, she draws a connection she hadn’t seen before. In the poem, “Dolly keeps a secret,” and she and Roland strip the dolls’ bed and find stacks of letters there. It’s the entire correspondence, both LaMotte’s and Ash’s letters, and it appears to be voluminous. Sir George is suspicious of their motives and leads them back downstairs. They plead their case: they only want first crack at the letters, they’re not interested in money or treasure-hunting. Lady Bailey appears to be on their side, but Sir George decides he needs to consult other people before deciding what to do with this huge find. They read through a few of the letters, glimpsing the excitement with which LaMotte and Ash first corresponded and then jumping to the end of the affair, reading Ash’s last letter: he agrees to return all the letters she sent him, which explains why both sets are now present. In the letter, he wistfully bids her goodbye, clearly at her urging. So now we’ve met Maud. We see her almost exclusively through Roland’s point of view. She is tall, beautiful, icy, better dressed than most academics, from a well-off family. She studies “the threshold” and is a LaMotte expert. She keeps her prized, beautiful hair tucked away where it can’t be seen. She once wore her hair almost shaved off because of the reaction of “the feminists”—she doesn’t want any beauty she possesses to discount her as an academic, a frustrating stance and a problem that hasn’t entirely gone away almost thirty years after this book is set. Maud is not, perhaps, unlike the Rapunzel of the first LaMotte poem we see, living in her tower with her long golden hair. She also has things in common with the heroine in “The Glass Coffin,” trapped in her coffin and surrounded by her golden locks, and only wanted for her beauty. And what an interesting tale “The Glass Coffin” is. In it, we have a brave tailor who, it is emphasized, is a craftsman but who is also interested in adventure. He is brave and true, and he helps those in need without thought, which opens doors for him. Roland is like him in many ways, (mostly) honest, happy to lend a hand: his selfless act of getting Lady Bailey free of the mud is what opens the door to Seal Court for him and Maud, something that almost certainly wouldn’t have happened otherwise. And he doesn’t do it with that intent, he does it because he sees an old woman in need of aid. The narrative itself is interesting. Introspective and not exactly feminist, we have a heroine who doesn’t ever want to get married but who is willing to marry the tailor because he rescued her; we have a narrator who is aware that while the tailor may speak truly when he gives her a choice in the matter, he may actually be manipulating her as men tend to do (or so the story suggests) because this is exactly what he needed to say to win her approval. But I don’t want to start drawing too many parallels or one-to-one relationships between “The Glass Coffin” and the rest of the work yet; we’ve a long way to go and this is a topic we’re going to come back to more than once. 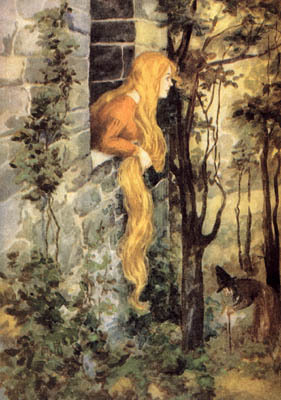 Art from the Grimm version of “The Glass Coffin.” Christabel chose to make her heroine’s hair golden, like Rapunzel’s, not dark as it seen here. We’re presented with rather a lot of reading material in this section. Poems and stories by LaMotte, snippets from Ash, several of both of their letters, and at last Blanche’s diary. LaMotte’s writing emphasizes the strange and fantastical. Elements of gothic and everday horror pervade her work, which is woven with supernatural themes. Her “Dolly” poem, recited by Maud in the dark as they look at the timeless dolls the poems are about, is positively chilling. The letters, as both Roland and Maud note, are alive, their urgency and emotion infectious. And Blanche’s diary is fascinating. We’ve yet to see through Christabel’s eyes, but we get an earful from her companion. It isn’t clear whether she is an obsessively close friend or lover (or both), but her jealousy and possessiveness are apparent. Blanche loves their little shared home, an anomaly for two women of their time, and fears any incursion. It’s noted in the previous section that Christabel rarely ventured out, and this seems to be fine with Blanche. She dislikes the letters that Christabel is writing; she seems weak and angry, deeply passive-aggressive toward her companion. She refers to Christabel as “the Princess,” at first worshipfully and then bitterly. It’s obvious there are power dynamics at play here. At first it seems that Blanche is under Christabel’s spell, her lady-in-waiting, but she becomes increasingly angry and agitated when it seems Christabel’s affections are being split. She’s that friend you had in grade school who got mad when you played with other friends. The possession here is clear: she wants to keep Christabel all to herself, to possess her in their enclosed space, their comfortable, cozy home. Maud works with the concept of the threshold, of liminal spaces, and touches on a paper she wrote about Victorian women’s conception of space: the desire for freedom in unconfined space versus the safety and voluntary confinement of being enclosed in “women’s” spaces: agoraphobia versus claustrophobia. 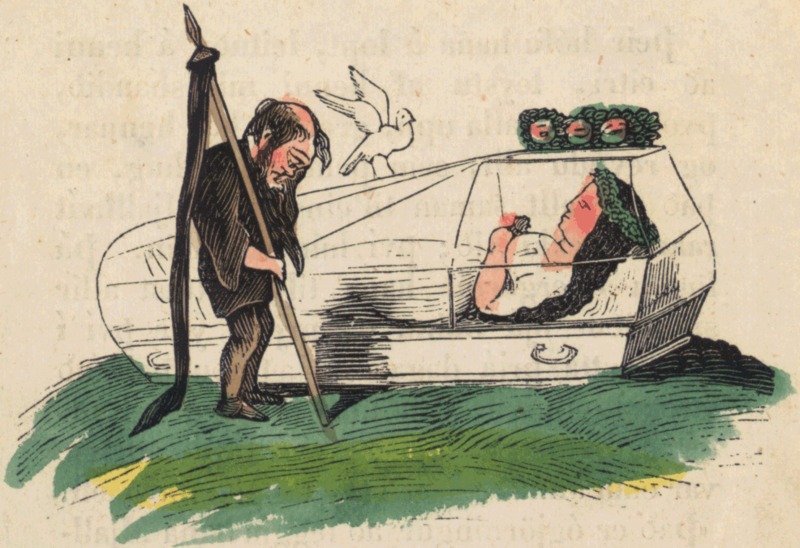 We see some of this liminality at work in “The Glass Coffin.” The tailor stands at several thresholds and is terrified of being enclosed underground; the princess is encased in a glass coffin, unable to escape. Roland, too, is caught at the threshold of academia, a part-time, starving researcher who hasn’t yet been granted entrance as a professor into the ranks of “true” academics. Maud, on the other hand, seems to inhabit her professional role comfortably for the most part, but again there is that hesitancy about her hair, about brains being discounted because of beauty. Space is contrasted heavily in this section: Roland’s cramped, dark, hot, disorganized world versus Maud’s airy, light, glassy, ordered one. The colour green is emphasized throughout; Maud’s head wrap, the tiles in the university, her bathroom, the countryside around Seal Court, which is juxtaposed against the forbidden garden Roland cannot enter from his poorly lit basement apartment. Currently he’s the one who is closed in and he doesn’t have the key to escape, no matter how much he wants to. The emotion in this section is what makes this book one of my favourites, though. The excitement shared by Roland and Maud is palpable and page-turning. Though they get off an uneven footing, they quickly recognize a spark between them, academically speaking. They approach their passions in the same way. They both study what is most “alive” to them amongst the (dead) Victorian period in which they work. Neither is interested in possessing the physical things of the person they study, but rather is interested in the thoughts, the minds, the actual lives. Both see immediately the connection Ash and LaMotte shared. They even agree to loop one another in on any discoveries with one another as their quest progresses. They don’t, perhaps, realize that they are sharing a similar connection, a confluence of two like minds. And what of Maud’s affair with Fergus? It sounds like it lasted longer than I first thought in the first few chapters, if it lasted the time it too for Maud to grow her hair long, and it seems to have had a more lasting effect on Maud’s emotions than Fergus’. What about the mysterious, brashy Leonora Stern? What will happen when she, Mortimer Cropper, and James Blackadder find out about these letters? What do you think of the story so far? Next week, we’ll meet some of these secondary characters, and poor Roland will find life with Val isn’t getting any easier. Follow the next steps on the hunt to discover just what happened between Christabel LaMotte and Randolph Ash! Enjoying this read -along, especially with this very dense book. I must comment on your observation of AS Bryatt’s repetitious use of the color green in this section. In fact, her use of “color” throughout the entire book, seemed so clumsy. Always gold or silver, maybe red hues mentioned so often, constantly, it was such torture, and distracting. Why? Good question. and thanks for your comment. Right now, I’m reading the emphasis on greenery around Maud, Lincoln University, and the countryside as a deliberate juxtaposition against Roland’s drab, dark, colourless world. His basement apartment, his basement workplace, his dark hair, the way he seems to fade into the background. . . he’s closer to the princess in The Glass Coffin than Maud is, in a lot of ways. He needs to break free of his little prison. I’ll keep an eye out for use of colour throughout and see if my opinion evolves or changes entirely.